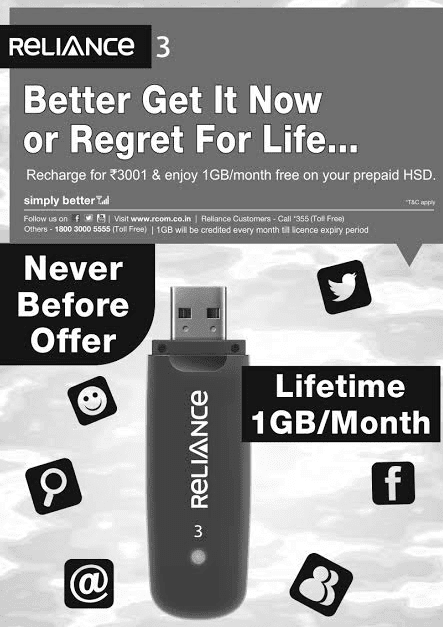 Here is a unbelievable offer from reliance communications. Get Reliance Net connect prepaid connection and activate life time pack with Rs.3001 and avail 1 GB internet per month for life time or till license expiry. Reliance Netconnect offers speeds up to 14.7Mbps on its Rev B network and up to 3.1Mbps on its Rev A network. All India roaming is available on all Netconnect plans over Rcom’s existing powerful CDMA network. On a one-time investment of Rs 3001, subscribers will be getting monthly data for lifetime or at least for next 5 years(till license expiry). If you are a Reliance Netconnect subscriber or use data on the move, we recommend grabbing this limited period offer before it expires.